Steven (Chicagoland, United States) on 9 November 2012 in Business & Industry and Portfolio. 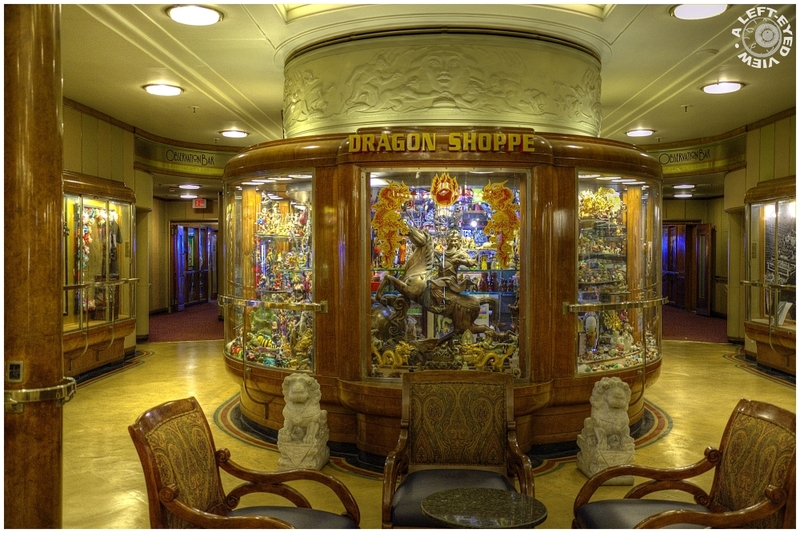 The most unique and eclectic gift shop in Long Beach, the Dragon Shoppe, located on the Promenade Deck of the Queen Mary, specializes in Asian culture, specifically items from China and Japan. Whether you’re an avid collector or simply looking for a fun trinket, they’re sure to satisfy your needs. For the serious collector, they offer a variety of authentic knives and swords. Beautifully decorated with intricate designs, these knives and swords make a great gift or addition to any collection. Other popular items they sell include exotic fans, purses, genuine jewelry, hair accessories, as well as a variety of knick-knacks and good luck charms. A very glittering picture, good to note all of those handrails, indicating that she was built to cope with heavy rolling seas. Sure looks outside my price range ! A wonderful indoor shot with marvelous colours and beautiful light. Looks like a very interesting little shop to browse around in. Fantastic scene full of detail - the light gives an atmopshere of unreality to the whole scene. great interior . super tones and details . Certainly very elegant ... and probably pricey ... good shot! The detail makes me feel like watching an exquisite miniature! Wonderful. Beautiful image - I like that you captured it so we can see the round shape of the shop. Beautiful colors and composition. Great shot of this elegant place ... the details and the finishes are really luxurious !!! Wow! My kind of place to shop! Beautiful color and detail. Superb. It's a great photo. Great work Steven. I like it. Have a lovely afternoon. Amicalement Antoine. Preiswert sieht dieser Laden gerade nicht aus. Wunderschöne Aufnahme.